He also made one of the most foolish decisions ever by a player in a World Cup match when he head-butted Marco Materazzi during the final minutes of the 2006 Final. Although I doubt any team in the world could beat my All-Time Best XI, I still don’t want to be playing with only ten men if Zidane decides to act like a billy goat and gets sent off. But, despite my strange (and fictional) fears, I still think he deserves this spot, and I’ll tell you why. 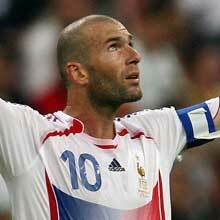 Zidane played brilliantly in the 1998 and 2006 WCs (he was on the team but injured in 2002), and he played a huge role in France’s first WC win in 1998, being named to the tournament Best XI and scoring the first two goals against BRA in the Final. In 2006, he was indisputably the best player in the tourney and was deservingly again named to the Best XI and awarded the Golden Ball. Yes, he will be better remembered for foolishly falling into Materazzi’s trap, but we should also honor his amazing play. So, I will lead the way by awarding him my final midfielder spot in my Best XI.